The core area of PWR vessel (Pressurized Water Reactor) undergoes continuously the neutron flux coming from the core fuel assemblies. At operating conditions the parent metal of the vessel is prone to induced embrittlement. For these reasons, this area has been inspected in France by ultrasonic methods since 1989. The detection of some UT indications spurred the Utility to request a specific examination tool to detect, to locate and to size accurately crack-like sub-surface defect. All the inner surface of the core shell of the reactor pressure vessel (RPV) has to be tested. The so-called VPM search unit was designed and developed by INTERCONTROLE to cope with this problem. The searched defects are perpendicular to the inner wall surface and located under the stainless steel cladding. The defect target size is 6 mm in through-wall extension and 20 mm in length whatever the orientation of the defect could be: either perpendicular or parallel to the cladding pass. Detection must be effective whatever the surface state could be "machined" surface, "ground" surface (limited undercut), "as welded" surface [rough aspect]. The selected UT method is based on an immersion technique using focussed transducers. Each of the transducers are probing the inner zone ranging from 7 to 25 mm in depth but with different beam directions. A measurement of the thickness of the cladding as well as an evaluation of its roughness state is performed at each local hit position. The UT search unit is mounted on the MIS (Machine d'Inspection en Service), the automatic manipulator used for NPP regulatory inspection. The UT method underwent a full qualification process in accordance with the French national RSEM code. Different qualification blocks including representative surface state have been used. The UT method is now fully qualified by the French utility. The core area of PWR vessel (Pressurized Water Reactor) undergoes continuously the neutron flux coming from the core fuel assemblies. At operating conditions the parent metal of the vessel, are then subjected to extreme levels of neutron flux during its lifetime. Figure 1 depicts the general layout of a PWR and the core region. The steel used in the manufacturing of RPV core shells is forged steel of type 16 MND 5. The base metal is clad on the inner side of the pressure vessel, which is in contact with borate water, with a stainless steel cladding at a rated thickness of 8 mm. The cladding is laid down in two stainless steel strips of approximately 60 mm wide. The surface condition of this cladding may vary from «factory machined» (such as in 1450 MW units) to «as welded» surface conditions, for CPY and CPO type 900 MW pressure vessels. The «as welded» surface condition presents undercut from 1 to 2 mm in depth between cladding layers, and solidification wavelets may be observed in the direction parallel to layering. Significant local slopes may also be observed in the perpendicular direction. This vessel parent metal (low carbon steel) is prone to induced embrittlement, which may give rise to in-service defects. This effect applies to the whole French nuclear fleet: 900 MW PWR as well as 1300 and 1450 MW type vessels. The searched defects are crack-type planar defects, perpendicular to the inner wall of core shells, and located under the stainless steel cladding. Generally such defects initiate on the level of the interface between the cladding and the vessel base material. Sometimes they also initiate in the base material itself and propagate in an outward direction. Such defects are localized in the very first layer of the inner surface: depth from 7 mm (minimum cladding thickness) to 25 mm, as measured from the inner surface of the pressure vessel. They are oriented either parallel or perpendicular to the direction in which the cladding was laid down (Cf. Figure 2 for the inspection geometry). Under specific operating conditions, the presence of sub-cladding defects at the level of the core shells may even compromise the proper operation of a reactor. This indicates to what extent a rapid and reliable detection and characterization of such defects is an important safety issue. Characterization consists in providing height, length and depth values for the defect and localizing its altitude and azimuth in the pressure vessel reference frame. In order to design an optimized tool, IntercontrÔle started by gathering technical data relative to the nature of the defects likely to be encountered, as well as the inspection performance levels required by the various power station operators. After a series of UT simulation using the CIVA modeling software from CEA (Cf. Fig.3), laboratory experiment took place on mock-ups. The search unit was named VPM - a French acronym that stands for First Twenty-five Millimeters. The VPM search unit comprises of an ultrasound head equipped with 5 focused transducers working in immersion. Four angle beam transducers probe the examined zone in two perpendicular planes and opposite directions (Cf. Figures 4 and 5). These 63 ° ; 2,5 MHz transducers have a focal spot about 4 mm in diameter. The fifth transducer, a normal beam UT probe, is used to measure both the profile and the cladding thickness. 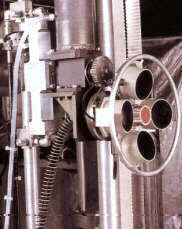 The In-Service Inspection Machine [MIS], fitted with the VPM search unit (Cf. Fig. 6), performs inspection of those core shells receiving the highest levels of radiation. All the operating MIS systems are currently equipped with this tool. 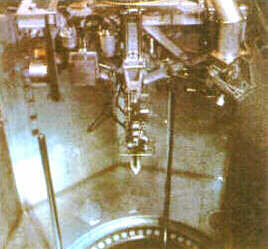 The ultrasonic equipment is partly located on the machine itself, and partly in a shelter outside the reactor building. Data is acquired in real time, in a STADUS file format, by a HP 1000 computer located in the shelter. This system offers real-time display of A-Scan, B-Scan, C-Scan, and D-Scan representation, enabling qualitative follow-up of the acquisition process (Cf. Fig.7) . The data is stored to hard disk, then transferred to HP data cartridges. Data is processed on a HP 9000 series 400 running STRATUSÒ software. Data, in SPARTACUS file format, as well as digitized B-Scan data, is also recorded in the shelter to magneto-optical disks (storage capacity of 1,3 GB per side). The processing of this data is handled by a HP 9000 series 700 workstation. UT data is analyzed using CIVAMISÒ software. Data acquisition is performed in step mode. The transducers sweep vertically, parallel to the inner shell wall, and then undergo an angular step increment in the horizontal plane. This methodology contributes to the effectiveness of the VPM inspection, which is perfectly well adapted to fulfilling the inspection objective. First, ultrasound profilometry of the inner surface of the vessel is performed in order to classify the surface condition according to pre-established criteria. The inspection procedure, at this point, calls for the application of acquisition parameters and processing specific to each type of cladding. Once this work has been performed, the examination may start. 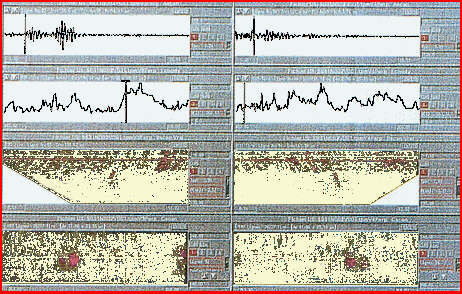 Detection is ensured through digital threshold acquisition, in video mode, in STADUS file format. This type of inspection is used because it enables reliable and fast acquisition of the area under inspection and easy analysis of recorded data. Maps are easily printed out. In order to characterize all recorded defects, the digital data of the full RF signal waveform is performed at the level of each indication. Characterization is obtained through analysis of crack- tip diffraction signals: signals coming from the top and bottom of planar defects. Additionally, time of flight measurement on diffraction echoes is done automatically. To do that, a fine-tuning of transducer time of flight is performed beforehand on artificial defects of known geometry. The characterization of defects with RPV inner surface in a «as welded» condition is technically quite difficult. The examination method developed by IntercontrÔle thus consisted in identifying the behavior of ultrasound beams and to determine any required corrections that may need to be applied to readings. This work has been done during qualification by taking into account the main features of the surface and the thickness of the cladding. In order to determine the defect envelope characteristics, the end position in depth must be recalculated along the whole length of the defect, millimeter by millimeter. This is done through use of corrective parameters. 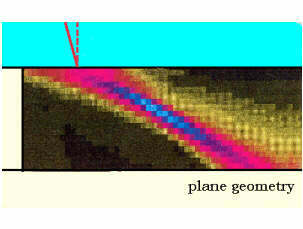 Their computation is based on the impact points of transducers with respect to the surface conditions encountered and the thickness of the cladding measured. Thickness measurements of cladding at the level of defects are also performed in order to confirm the conditions under which the examination is performed: it ensures that there is no sudden variation in thickness of the cladding that could modify the conditions of detection and characterization of defects. In addition, these measurements make it possible to provide information on the ligament present between the crack tip and the interface between the stainless steel cladding and the base material. Intercontrôle used clad mock-ups representative of the various RPV to be inspected. They comprised of three different types of surface conditions most frequently encountered in vessels. These mock-ups contained approximately 60 realistic defects embedded under the cladding. In addition, 24 EDM surface breaking notches were machined. Reference blocks without cladding were used to calibrate transducer sensitivity and time of flight measurement as well as to characterize acoustic beams. All of these reference blocks and mock-ups were then immersed in a test tank representative of a reactor pressure vessel. Intercontrôle had already drafted in advance a technical justification file describing all of the parameters likely to have an influence on readings and detailing the technological choices made. The technical choices were supported by calculations, modeling and physical reasoning. Subsequently qualification trials - including procedures, methods, equipment, staff - were carried out with an in-service inspection machine (MIS 6) fitted with the VPM search unit. Trials were successfully conducted in conditions similar to on-site inspection. In any case, the target defect (6 *20 mm) were detected and sized with good accuracy. The objective of the VPM tool has been successfully achieved. Sub-surface crack detection and characterization is now routinely performed by INTERCONTROLE at the request of the French Utility. The UT method has been fully qualified according to the RSEM code (1997 edition). The first industrial inspection took place at Tricastin NPP in February 1999. Some defects were detected and characterized. The accuracy of the UT technique, proven by the qualification dossier, makes possible to perform reliable structural integrity assessment. The work demonstrated that, due to their very nature, these defects were non-evolutive and that they don't compromise the safe operation of the reactor. So, in exchange of preventive measures, the Safety Authorities gave the authorization to restart the unit. This development illustrates the key role of a NDT technique when safety issues are at stake.